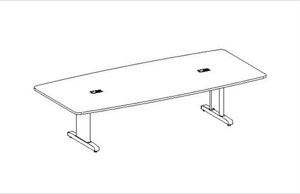 Full-size CSII / Accorde conference tables with optional table top grommets for wire management access for computers and presentation equipment. The CSII Series also offers a Premium Leg or Slimline Leg design. Three shapes of conference surfaces: Racetrack, Boat, and Rectangular. All tables are 29"H overall. Table legs are constructed of 14 gauge steel and available in Mayline's standard black finish. Tops constructed of 1 1/8" thick high pressure laminate with t-mold edge. Tables can be ordered with optional grommets. Electrical Power / Data Modules can be ordered at this link - SPM Module. If ordering optional power module, table must be ordered with grommets. Slimline legs are 7"W and Premier legs are 13"W. Both have integrated cable channels within table legs. All tables standard with two legs, except for 120" with three legs. Base Finish: List prices shown are for black base finish. The bases can be finished in any other standard paint for a $50 upcharge. Kwik-Ship Finishes: Mahogany, Nebula Gray, Windswept Pewter, Classic Rock, or Crown Cherry laminate. Black, Desert Sage, or Medium Tone paint. Mayline CSII Accorde Series full-size conference tables with optional power and data modules are designed for optional power and data access to operate computers and presentation equipment during meetings. Mayline CSII Accorde Series full-size conference tables with optional power and data modules are designed for optional power and data access to operate computers and presentation equipment during meetings. Mayline CSII Accorde Series full-size conference tables with optional power and data modules are designed for optional power and data access to operate computers and presentation equipment during meetings. The tradition of innovation in desktop power and data solutions continues. The elegant design makes these units ideal for Home, Healthcare, and Hospitality environments. Mayline CSII Accorde Series full-size conference tables with optional power and data modules are designed for optional power and data access to operate computers and presentation equipment during meetings. Look what's popping now: The next generation of flexible desktop power and data solutions for executive and institutional work station applications. Retractable and durably constructed, These Modular High Output convenience modules are highly functional with a fluid one touch door that remains open during use. Mayline CSII Accorde Series full-size conference tables with optional power and data modules are designed for optional power and data access to operate computers and presentation equipment during meetings. Mayline CSII Accorde Series full-size conference tables with optional power and data modules are designed for optional power and data access to operate computers and presentation equipment during meetings. 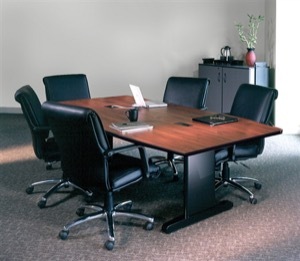 CSII Conference Table legs are constructed of 14 gauge steel and available in Mayline's standard black finish. Tops are constructed of 1 1/8" thick high pressure laminate with t-mold edge. Tables can be ordered with black grommets. Slimline legs are 7"W and Premier legs are 13"W. Both have integrated cable channels within table legs. All tables are standard with two legs, except for 120" with three legs. 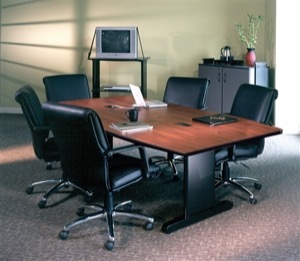 CSII Conference Table legs are constructed of 14 gauge steel and available in Mayline's standard black finish. Tops are constructed of 1 1/8" thick high pressure laminate with t-mold edge. Tables can be ordered with black grommets. Slimline legs are 7"W and Premier legs are 13"W. Both have integrated cable channels within table legs. All tables are standard with two legs, except for 120" with three legs. Mayline CSII Accorde Series full-size conference tables with optional power and data modules are designed for optional power and data access to operate computers and presentation equipment during meetings. Save up to 70% on select Mayline Accorde Conference Tables, conference furniture, cabinets, buffets, and presentation whiteboards. As an added benefit we offer FREE SHIPPING on our Mayline Conference Tables.